"A sumptuous archive of insight into the wildly varied cinema of Takashi Miike from the world’s foremost authority." From outrageous flavor of the month to respected modern master – Takashi Miike’s rise to fame has been stellar. The former bad boy of Japanese film is now a regular at the world’s most prestigious film festivals. Re-Agitator: A Decade of Writing on Takashi Miike is the brand new book by Tom Mes, whose groundbreaking Agitator: The Cinema of Takashi Miike helped shape this filmmaker’s international career. Tom has been along for the ride ever since the notorious Audition turned heads and stomachs at the turn of the millennium. Re-Agitator collects more than ten years’ worth of his writing on Miike. From dusty film sets in Japan to festival intrigue on the Riviera, and from the straight-to-video ghetto to the stage, Mes covers the full scope of this unclassifiable filmmaker’s life and work – with the kind of detail and intimacy that only an insider can provide. Fully endorsed by the filmmaker himself, the full-color Re-Agitator: A Decade of Writing on Takashi Miike also features a provocative foreword and a gallery of unique set photos by long-time Miike collaborator Christian Storms. Re-Agitator is a hardcover, limited edition collector’s item, strictly limited to a print run of 1000 copies worldwide! Re-Agitator: A Decade of Writing on Takashi Miike is available now from FAB Press and all good book stores and online retailers. "With Imprint, we started off with a 25-page script that I translated and then got the call from Showtime and Mick Garris. Cut to phone call with Miike on set somewhere. Now we’re talking. This is the greatest rock-n-roll swindle ever. Miike went on to describe a few scenes. I took intense notes." Takashi Miike has permanently shed the ‘flavour of the month’ image he held in the early years of this century, in the wake of his international breakthrough with Audition. Starting with Gozu’s selection for the Director’s Fortnight in Cannes in May 2003, Miike’s films have become regulars at the world’s top festival. He seems to be a favourite at the Mostra in Venice in particular, having shown there twice in competition: Sukiyaki Western Django in 2007 and 13 Assassins in 2010. 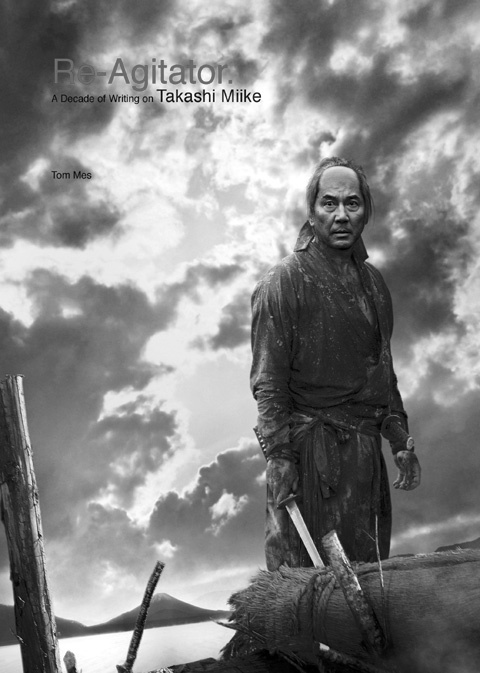 In 2011, Cannes followed suit with Hara-Kiri: Death of a Samurai. Gone too are the days when every piece of writing on Miike contained the words "wild" and "crazy". Takashi Miike is now the subject of countless student theses, while non-academic writers are also taking an increasingly reflective approach to his oeuvre. This is also made possible thanks to the widespread availability of subtitled DVDs of a sizeable part of Miike’s extensive filmography. Just to be clear: Re-Agitator is not Agitator Volume 2. It doesn’t continue where the first one left off. Look at it as a companion piece: it collects the vast majority (i.e. everything that didn’t make me cringe upon re-reading) of the writing on Miike that I have done over the years for magazines and websites in various countries, as DVD liner notes (CD liner notes, in one case), in non-English-language books, for my own website MidnightEye.com, as well as for festival catalogues and press kits. Since the material comes from so many scattered sources, this collection will be brand new to just about any reader. Some if it has never in fact been published, such as an interview recorded at the 2005 Venice film festival and an account of the adventures of Miike and the Gozu gang in Cannes, plus a piece on 13 Assassins written exclusively for this book. This new book contains a wide variety of styles, tones, viewpoints and approaches: from impressionistic reviews to personal eyewitness accounts and loose, appreciative write-ups. Re-Agitator is also an opportunity to add some context and background on the development of the Japanese film industry over the past twenty years and Miike’s career therein, something that was largely absent from Agitator. If there is a message contained in these pages, it’s one that can be summed up in a single word that also holds true for the films of Takashi Miike: Enjoy!